These workshops are a highlight of my year. We spend time in beautiful natural areas exchanging photography and entomology tips, but the best part is the happy community that has sprung up around our workshops. If you haven’t been yet, you should try to this year. We’d love to have you. It occurs to me I’ve not yet mentioned the upcoming BugShot workshop on this blog. This macro photography mini-conference has been a highlight of my year since I organized the first one in St. Louis in 2011. Every summer, 30 or so insect photography enthusiasts gather for a long weekend in a natural setting to trade tips on gear, hunt for local arthropods, and most importantly, hang out with like-minded insect nerds. The instructors are always some combination of myself, John Abbott, Thomas Shahan, and Piotr Naskrecki, but I use the term instructor loosely. BugShot has become more of a conference and less of a pulpit, and the instructors invariably learn a great deal from the people who attend. I owe much of my progress in recent years to the interactions I’ve had with others at these events. BugShot has been to Missouri, Florida, and Belize; our next stop this May is a pristine coastal island in Georgia, Sapelo Island. Astoundingly, we’ve secured an actual mansion to host our event. Pogonomyrmex badius, the Florida harvester ant, is one of many unusual species we’ll encounter at BugShot/Sapelo Island. One final reason to attend, though, is one I hadn’t anticipated when we started and one that is significant for both aspiring scientists and aspiring photographers. Because of the varied people who participate, a blend of creative and entomological professionals as well as enthusiasts who work in other fields, BugShot has turned out to be not just a fun weekend but an intimate professional conference. These small gatherings are excellent places to make connections, start collaborations, and pick up techniques for reaching career or artistic goals. BugShot has been a professional stepping stone for a lot of people. I’ve seen BugShot alumni photographs in calendars, books, gallery shows, research papers, newspapers, high-traffic website, and conference advertisements. Some have even started local workshops. It makes an event organizer proud. The happy crew at BugShot 2012 in Florida. Photo by Josh Mayes. We only have four spaces remaining- you’ll want to register soon to reserve your spot! Ok, enough silliness. I have news. I am positively tickled to announce our little BugShot family is expanding. Who have we added? None other than Piotr Naskrecki! Piotr is a master conservation photographer, a katydid expert at Harvard’s Museum of Comparative Zoology, author of “Relics” and “The Smaller Majority”, and a founding member of the International League of Conservation Photographers. I’ve long been a fan of Piotr’s distinctive wide-angle macro style. And now, he is bringing it to BugShot’s newest tropical workshop. I couldn’t be happier! BugShot/Belize will be held September 22-29 2013 at the remote-yet-comfortable Caves Branch Lodge in Belize. We will be spending a week with army ants, orchid bees, glasswing butterflies, cave crickets, and countless other arthropod treasures. The safari will be a mix of entomological and photographic instruction, and in the tradition of BugShot each of the instructors brings a different talent. 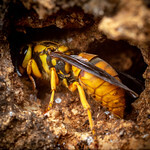 John Abbott is a talented high-speed action photographer, Thomas Shahan is an intimate portraitist, Piotr Naskrecki is a master of capturing arthropods in their habitat, and I do… something with ants, I think. Our last Belize workshop sold out within 2 weeks, so if you’d like to join us I recommend signing up sooner rather than later. For an in-depth look, I’ve uploaded more photos to the BugShot Belize Gallery. The happy group makes antennae for the camera! (BugShot 2012, Archbold Biological Station, photo by Josh Mayes). 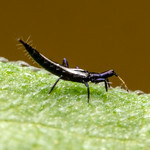 I’m back from a simply tremendous weekend at the 2012 BugShot photo workshop! This year’s event was handily attended by a cadre of social media-savvy bloggers, so rather than recap the festivities myself I will leave you in the capable hands of participants. I will continue to update the list as more material works its way to the internet. We are working on a schedule for 2013, including west coast and international courses. Stay tuned!